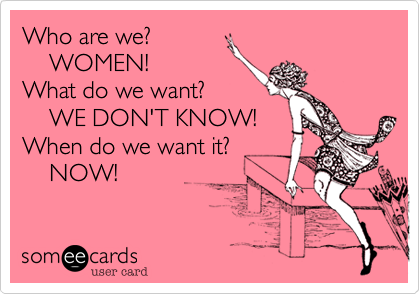 What do women really want in a relationship? It’s the age-old question that everyone makes jokes about but no-one can truly answer, not even us most of the time. We like perfection, yet simplicity at the same time in a relationship which can make things very confusing. If you fall into the ‘confused’ category, we’ve put together a short list of 5 things most of us would agree on. Help your man out and pass the list onto him when you’re done reading! What do we want in a relationship? Men: Keep the spark alive with gestures of love and affection. Remember the first few weeks of your relationship, when you bent over backwards trying to impress your lady? Acts of romanticism, spending hours on the phone, taking her to nice places… That is how she fell in love with you. Women are demanding, we know but if you want to keep that spark, you’ve got to create those moments again and again throughout your relationship. You need to give her the same butterflies she got at the beginning, remind her why she fell in love with you. Men: You need to understand that women are sensitive. Those simple little things you say or do without thinking could have a woman upset for weeks. Yes, sometimes we overreact (or maybe a little more than sometimes) but women look into things a lot deeper than men do. If you say something like, “Why are you wearing that dress?” A lot of women would instantly be offended because you don’t like it or they look fat in it or it’s not age appropriate… The list goes on. As a word of advice, think twice before you say something that could come across as offensive. Also, if a woman is upset or angry about something and you can’t work it out, just be supportive. If she doesn’t want to talk about it, leave it be. If she does, try to understand her point of view, even if it is ridiculous. Men: Don’t you think it’s unfair that us women spend endless hours on our appearance to look good for you, when most of you get around looking really scruffy? Start scrubbing up a bit! Women want men who take care of themselves – their health and their image. Listen to what women say they like. If a woman says you look good with a little stubble, then grow it. If they say your style could be better, then get some new clothes that fit properly and suit you (best to ask for advice). If they say that they like you to smell good, shower daily, brush your teeth and wear a hint of colone, simple. If you feel that you’ve lost some of the spark in your relationship, those small changes should have it back in no time. Be the man your woman wants to show off to her friends! Men: This is a big one. Without trust there is no relationship. Build trust by involving your other half in the activities you do. If there comes a time when you want to do something on your own or with friends then just say. Don’t start lying because that’s when you break the trust. Being truthful, no matter what, will significantly help you along in your relationship. You also need to be reliable. If you say you’re going to be somewhere and you don’t turn up or you plan to do something and then don’t go through with it, you can make it very difficult for a woman to rely on you. Don’t get a woman’s hopes up and then crush them because she’ll remember it. Again, make loving and affectionate gestures, do things to make her happy, make sure she knows you love her because it will make it so much easier to trust you. If you’re coming home late at night, spending time away all the time or not openly communicating, whether you’re up to anything or not, it doesn’t give her much to go by. If a woman knows you want her and only her, she’ll be happy. 5. Some Get Up and Go! Men: Women love a successful man, so let that be some motivation to reach even higher and achieve bigger, better things! Make them really proud of you! When you’re not working though, spend some time with your lady doing something fun and exciting. Take her out jet-skiing or out for a night of dancing. Get her heart pumping. You also need to make sure you create some down time. Sit down together, relax, chill out and talk. If she’s not in the talkative mood, stick on a film and snuggle up with a cosy blanket. It’s all about balance!